The Royal Meteorological Society (RMetS) is the United Kingdom's professional society whose mission is "to advance the understanding of weather and climate, the science and its applications, for the benefit of all". The RMetS plays an important role in the work of the United Kingdom's government, providing authoritative and objective advice for policy makers on issues such as climate change, global warming and weather forecasting. The headquarters office of the RMetS is located in Reading, Berkshire. Dr. John Lee and nine others (John Drew, Vincent Faisel, James Glaisher, William Johnson, Samuel King, Edward Joseph Lowe, Charles Lowndes, Joseph Bancroft Reade and William Rutter) founded the British Meteorological Society on April 3, 1850 in the home of Dr. Lee, near Aylesbury, Buckinghamshire. On the following day, Dr. Lee's wife and four others were admitted (William Johnson, Charles Lowndes' wife, John Slatter and William Stowe). At the first ordinary meeting of the British Meteorological Society on May 7, 1850, the membership grew by a further 75. The name of the Society became The Meteorological Society in 1866 when it was incorporated by Royal Charter. In 1883, the name became the Royal Meteorological Society when Queen Victoria granted the privilege of adding 'Royal' to the name. Consolidation with the Scottish Meteorological Society occurred in 1921. By January 1, 2010, the total membership of the Royal Meteorological Society had grown to 3,088. The Society's affairs are run by a Council of Trustees and its Committees. The Council consists of 17 officers and ordinary members elected at the annual general meeting. The officers include a President, elected for a two-year term, who is supported by a Vice-President for Scotland and three other Vice-Presidents, the Treasurer, General Secretary, four main Committee Chairmen and ordinary members of Council. The Council of Trustees meet four times a year to manage the governance of the Society, guided by the Society's Royal Charter, By-Laws and Standing Orders. The Council also sets the strategic plan of the Society and reviews the delivery of that plan. 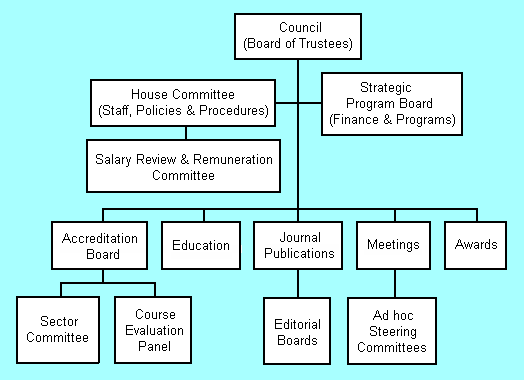 The organizational diagram of the Council. Provide valuable, informed evidence-based advice to the United Kingdom government as well as cooperating with various international organizations. Fellow: Normally requires a formal qualification (e.g., a first degree in a science subject and/or post-graduate degree or a National Vocational Qualification (NVQ) in a relevant discipline) and at least five years of professional experience within or directly related to meteorology. Associate Fellow: No formal qualifications are required other than an expressed interest in the subject. Corporate member:' Corporate membership of the Society is open to all organizations that wish to support the Society’s charitable objectives. School member:' Schools are also welcome to join. Students: There is no lower age limit but those over 21 may be required to provide proof of full-time student status. Honorary member: This is an honor bestowed by the Society at their discretion on distinguished members of the profession and carries the full privileges of Fellowship. Th Society has ten Local Centers spread across England, Scotland and Wales to facilitate participation by members who cannot often travel to the Society's headquarters in Reading. The formation of additional Local Centers is encouraged. The Quarterly Journal of the Royal Meteorological Society: One of the world's leading meteorological journals. Publishes original research in the atmospheric sciences. There are eight issues per year. International Journal of Climatology: Covers a wide range of climatology research. There are fifteen issues per year. Weather: A monthly magazine for specialists and general readers with an interest in meteorology. It uses a minimum of mathematics and technical language. Meteorological Applications: A journal for applied meteorologists, forecasters and users of meteorological services, which has been published since 1994. It is aimed at a general readership. Atmospheric Science Letters: An online publication used for shorter contributions in the field of atmospheric science and related subjects. Wiley Interdisciplinary Reviews (WIREs): A journal to promote cross-disciplinary discussion of global phenomena with long-term societal implications. Published in association with the Royal Geographical Society (with the Institute of British Geographers) six times per year. ↑ Note: A Royal Charter is a formal document, issued by a monarch, granting a right or power to an individual or a corporate entity. This page was last modified 17:53, 30 December 2010.